Remember this post? Well, last evening I managed to cut the jacket (just the fabric, the lining not yet). The fabric is a very stretchy wool, a bit tweedy. The collar and the cuffs are cut from a creamy white wool. The pearl trim is there (bought it in Brussels six months ago, having this jacket in mind), I've got a very nice black silk lining pre-washed and pressed but still have to cut it. I've got silk embroidery thread, hooks, chain, everything is there. I've used Vogue 7975, the shorter buttonless version (view A, B, C). I've used Burdastyle Eva 4102 for the shape of the neckline and the collar. The purple top has the collar and the sleeves of Idit 6003 (I really liked the gathered sleeves, they make the tops a little more special and more blouse-like, not just T-shirts). All three tops are made in cotton/lycra. The gathering of the sleeves is done by serger and I've used this tip, which made it really easy. And I stabilized the necklines with 3/8 clear elastic. And since I've tried the sleeves of Idit 6003, I wanted to make the entire top. And here it is, in a wool/poly interlock. Apologies for the camisole, it's not the best one for this top plus I had a black bra underneath, but the photos were taken after a very long and busy day at work and I really didn't have the energy to find another camisole and another bra. I'm not sure I really like this Idit blouse on me... Read the PR review for Idit here. I love sewing knit tops, they are so quick. I've cut the three first tops on Friday evening, I sewed them all Sunday. Sunday evening, I cut and sewn the Idit top. So one weekend, four new tops... not bad! This was really easy and quick to make, I cut it and finished it in about one hour and a half and it is done entirely by serger, including the hem which is blindstitched with the same serger. The fabric is a nice cotton knit with a texture (you can see it in the photo above) and the back of the cotton is a bit fluffy, you know like in bathrobes. I'm sure there is a name for this fabric but I don't know it or can't remember it. Sewn the shoulder seams on the garment part and the fabric part, pressed the shoulder seams of the two in opposite directions (for the garment part, they are pressed to the back and for the lining to the front), in order to reduce bulk, especially at crossing seams. Sewn the neckline of the garment part to the neckline of the lining part. I didn't want to understitch because too lazy and in a hurry (I did this the evening before I flew to Brussels and the plane was at 7.00 a. m.) so I took care in doing everything to avoid seams showing on the garment part. Turned the two pieces right side out, pressed the seam towards the lining part and then pressed the two of them together, making sure the seam is a bit on the underside. Turning the seam a bit to the underside made the lining part a bit bigger at side and armhole seams therefore I cut the part peaking outside the garment part. I then stitched the two armholes together, turned and pressed. Making the lining part smaller keeps all the seams on the underside and they don't show at all. Pressing carefully makes them lie flat even without understitching. For hemming knits, I've been using this tip by Sewing Diva Gigi for quite some time now. Great tip, it definitely improved the appearance of my hems. This was more of a wearable muslin (I'm not that crazy about this cotton knit and I think the colour will fade during washing) and I plan to do another one in a green interlock, but it looks very nice. I've worn it in Brussels (with a black turtleneck and my houndstooth jacket) for a visit to the European Parliament and it was perfect! The pants are Hot Patterns Denim Diva Pipe Jeans, made in a stretch black denim. I cut a size 6 and they ended up loser than I thought but I decided to keep them this way. I find that, especially for clothes that follow closer the body, I like them to be a bit loser - they make you seem slimmer and more ... I don't know, classy?? This time I used a twin needle (100, space between needles 6 mm) to do the topstitching. Sorry for the wrinkles, the pictures are taken after wearing the pants in the office for an entire day. Salsa pants for my husband - a combination of the Classic Men's Jeans from e-sewingpatterns.com (see the jeans I made from this pattern in this post) and the Grey pants pattern from m-sewing.com (see the pants I made from this pattern in this post). I used this last pattern for the leg, a wider leg is very good for dancing Salsa and as the fabric is drapey, it worked great. I underlined the fronts, going well below the knee, to minimize wrinkling at crotch and knee level. And I've used again Debbie Cook's tutorial for the double welt pocket and am very pleased with the result. And now, my fourth wardrobe piece... one that I totally love, I think this is my favorite skirt pattern ever! Vogue 8246. The fabric is a black washed stretch denim. However, I cut with the stretch on the length of the pattern pieces, not the width. I thought I might have to grade down and didn't want the additional stretch to make the job tougher. I did a petite alteration, took in the side seams by 1 cm (3/8") each and shortened the skirt, because I wanted it to hit just below the knee. I also reduced the hem allowance from 3.2 cm (1 1/4") to 1.3 cm (1/2"). The back hem is rounded and it is so much easier to get a neat hem with a narrower hem allowance. Other changes that I made are due to not having enough fabric. I had 1 m of fabric (for a straight skirt I normally need 50-60 cm) and it wasn't enough. Therefore I had to make a center seam to the center front piece instead of cutting it on the fold. In order to "camouflage" this seam, I zigzagged over all the seams (5 mm length 2 mm width) with black topstitching thread. I like very much the final result: all those vertical seams, topstitched in black give a lot of vertical lines that lengthen my petite frame. I thought about topstitching with a straight stitch (like in jeans) but my seam allowances are butterflied and a straight topstitch works better with seam allowances together. See the pleat underlays below. The other change due to lack of fabric is that I cut the pleat underlays from black cotton sateen. To cleanly finish the facing and join it to the invisible zipper, I've used a great tutorial written by Jinjer Markley and posted on Kathleen's Fasanella's website, Fashion Incubator. Part 1 and Part 2 of the tutorial for inserting an invisible zipper, making and using a pressing jig and sewing the the zipper to the facing in an RTW way. I bound the facing with some polkadotted bias. The rest of the seam allowances are serged. This is a great pattern, easy to sew (especially since there's no lining, it was a breeze after all the underlining and seam binding I've done lately). I want to sew it again, I will try it in some suiting. I'm also thinking about using this pattern without the underlays, maybe keeping the center one for walking ease and eliminating the rest but keeping the contouring seams. TimmelFabrics SWAP 2008 is ready to start. It's starting on 1 January 2008, but: 1) you can cut and fit everything until then; 2) you can use TWO previously sewn items. And a bought one too. There are several interesting things, and the yearly twist, so go and read the rules here. The SWAP 2007 photos and commentaries are here. The article that started the contest and several other wardrobing articles (very interesting reading!!). And the SWAP 2008 discussion has started already, at the Artisan's Square - go here for the board. I'm ready to start planning this SWAP, ordered some patterns today (one is Vogue 7975 for my Chanel-type jacket), but it's going to take a while. I would like to incorporate as much as I can from my already existing storyboard, plus I'm still hesitating between a jacket or a coat for this SWAP. Carolyn from Diary of a sewing fanatic reminded me of my dream - sewing a Chanel-like jacket. 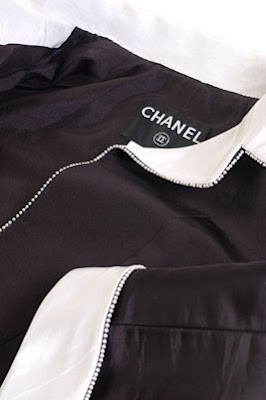 See this post and this one on her blog, about sewing a Jackie Kennedy inspired suit, using the Chanel technique of quilting the lining to the fashion fabric. And now... let me show you the exact piece that haunts me and then, I will say no more... except that I will be trying my hand at this, including the quilted lining and everything, even if my fabric is not a boucle and is not tweedy, therefore it is harder to "hide" your quilting. I did some tests and hope I can pull it off.